Team Valor International's Capla Temptress was never in doubt during Saturday's Grade 3 My Charmer Stakes at Gulfstream Park, rating about mid-pack and surging to the lead in the stretch for a two-length victory. The 3-year-old daughter of Lope de Vega, ridden by Joel Rosario for trainer Bill Mott, covered a mile over the good turf course in 1:39.08 for her first win of 2018. Ridden by Joel Rosario for Hall of Fame trainer Bill Mott, Capla Temptress settled in mid-pack as Cherry Lodge went the opening quarter-mile in 23.86 seconds and the half in 48.28 chased by Pas de Soucis with Cherry Lodge's Todd Pletcher-trained stablemate Bellavais leading the second flight and La Moneda kept in the clear four wide. Assistant trainer Kenny McCarthy (Capla Temptress): “She's been in Kentucky for a little bit and ran a credible race over at Keeneland. We then sent her down here and had a little time prior to this race. I think Bill was pretty confident today going in. A little worried initially when the rain hit, worried about what kind of ground she really likes, but at the same we felt like this turf course is in such great condition we'd take a shot with her. Bred in Ireland by Pier House Stud, Capla Temptress was a $29,263 yearling at Goffs. She began her career in Europe, placing in group company, then captured the G1 Natalma at Woodbine as a juvenile. Transferred to the United States in June of 2018, she struggled to find the winner's circle, but a slight class drop solved that problem. Overall, Capla Temptress' record stands at 4-1-1 from 11 starts for earnings of nearly $350,000. 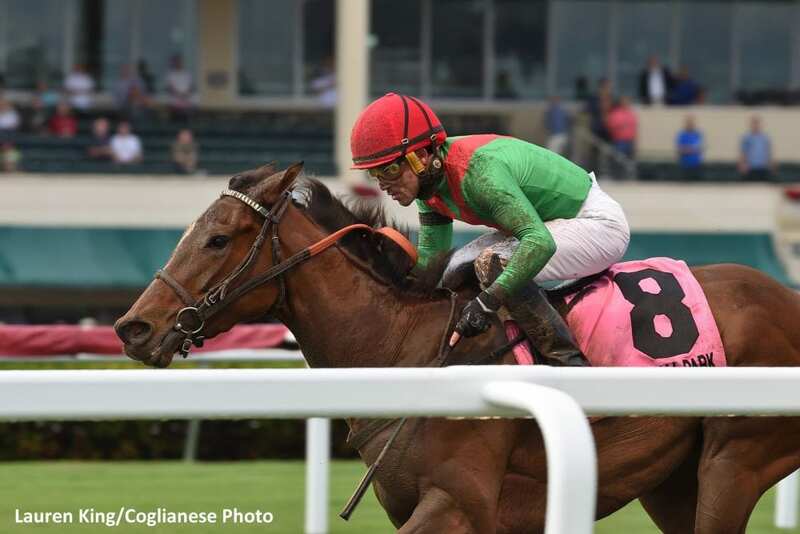 This entry was posted in Racing and tagged bill mott, capla temptress, Gulfstream, gulfstream park, joel rosario, lope de vega, my charmer stakes, team valor by Paulick Report Staff. Bookmark the permalink.